Figure A70. Papua anomaly, interpreted as the Papua slab, with (horizontal) [vertical] cross sections through (A)[D] the UUP07 p-wave) and (B)[D] the combined SL2013 and S40RTS s-wave models at 550 km; C) the location of the modern geological record that we interpret to have formed during the subduction of the slab. The Papua anomaly (Figure A70) corresponds to the northern part of the A7 anomaly of Hall and Spakman (2002; 2004) and underlies an area from Papua New Guinea to the New Hebrides and from the east Australian margin to the Solomon islands, flat-lying at the top of the lower and base of the upper mantle. At its top it is south of the base of the New Hebrides and New Britain slabs that subducted since ~10-15 Ma. 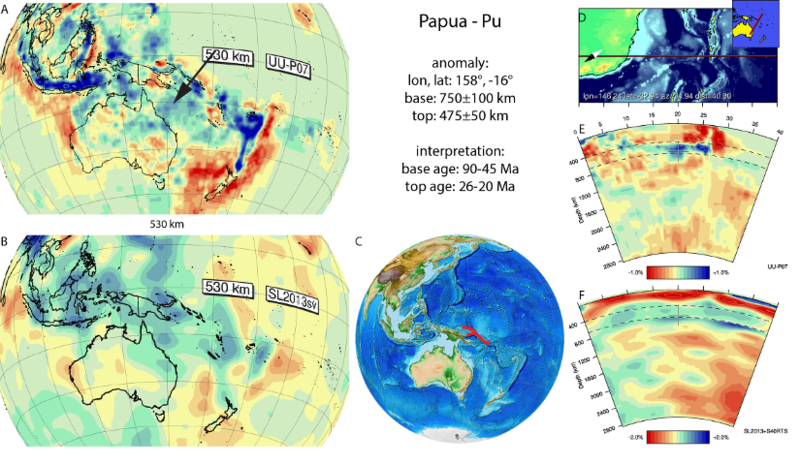 Hall and Spakman (2002; 2004) noted that the Papua anomaly is not everywhere well-defined and may in fact represent more than one slab, whereby the southwesternmost part of the slab below NW Australia (the Welford slab) may be disconnected from the northern and eastern parts of the anomaly, which is the interpretation we follow here to account for the subduction records of both the Melanesian and Trobriand troughs. Hall and Spakman (2002; 2004) interpret the northern segment of the anomaly from Papua New Guinea to the New Hebrides to result from subduction at the Melanesian arc, from 45 Ma until the collision with the Ontong Java plateau, ~25 Ma, based on the reconstruction of Hall (2002). We adopt a somewhat large age range of 26-20 Ma for the collision of the Ontong Java plateau based on published estimates of Hall (2002), Quarles van Ufford and Cloos (2005), Knesel et al. (2008), and Holm et al. (2013) as estimate for the age of the top of the slab. Hall (2002), Cloos (2005) and Gaina and Müller (2007) interpreted the onset of subduction below the Melanesian arc to occur ~45 Ma ago, and Wu et al. (2016) since 50 Ma. Schellart et al. (2006) interpreted westward subduction below the Melanesian arc to have been ongoing since at least 90 Ma. We therefore adopt a large, 90-45 Ma range for the age of the base of the slab.